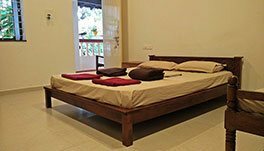 Located just 5 minutes walk away from the famous Calangute – Baga Beach, Fatima Guest House is a truly Goan experience. 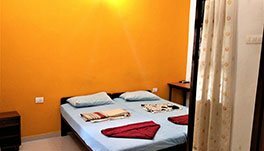 This is Standard Air Conditioned Double bedroom with an attached washroom equipped with a Television Study Table Cupboard and Long Mirror elegantly decorated and equipped with all the amenities for comfortable stay. 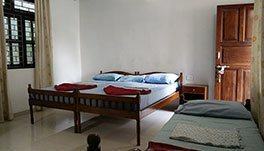 Spacious Air Conditioned Double bedroom along with extra bed with an attached washroom equipped with a Television Study Table Cupboard and Long Mirror elegantly decorated and equipped with all the amenities for comfortable stay. 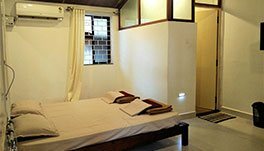 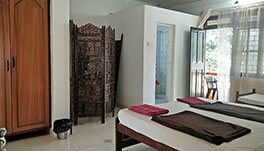 Spacious Air Conditioned Double bedroom along with an extra bed attached washroom equipped with a Television Study Table Cupboard and Long Mirror elegantly decorated.